Nozawa Onsen offers some of the best skiing in Japan. Not only is it the oldest ski resort in the country, dating from 1912 when one Herr Schneider recognised its potential, but it was one of the resorts that hosted the 1998 Winter Olympics. Its proximity to the coast of the Japan Sea, 60km to the north, exposes even low altitudes to the Siberian storm fronts, bringing copious (and powdery!) snow to its slopes. Nozawa Onsen welcomes both boarders and skiers, and has na evenly balanced range of terrain from cruisy beginning slopes through aggressive pistes, and, for the adventurous, tree and back country snow. It is also popular with cross country skiers and, later in the season, snowshoers. For many Japanese, however, the real attraction is hinted at by the village’s name “onsen” – “hot springs”. For far longer than there has been skiing, there have been natural restorative hot springs here, and year-round you’ll find domestic guests coming for “onsen-meguri” – the bathing equivalent of a pub crawl – trying as many of the 14 local hot spring baths (13 of them, free) as they can. You should too! Each bath is maintained by the neighbouring residents in rotation, for their own use as well as guests. You can make a small donation in the box outside the bath for its upkeep, but a heartfelt “thank you if you bum into a local resident enjoying his or her evening bath will be just as much appreciated. 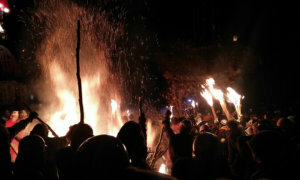 The main event of the season is the Fire Festival on january 15th each year. Much has been written about it so we won’t go into detail. Suffice to say that it is extraordinary and that it’ll challenge your notion of Japanese as polite, peaceful, and disciplined for ever more! For the villagers, the festival is the culmination of three days’ of activities. If you want to watch the festival up close, you’ll start to see activity from 6.30pm, while the heated (!) action gets going around 8.30pm. If you have the opportunity to attend, please note two things. First, it is very much the defining cultural event for the village. For some of the villagers, the fire festival is a private celebration of their “Nozawa-ness”, it’s real, and not a tourist show. Second, the sake flows very freely, and for the participants will have been flowing freely for three days; be prepared to meet some very drunk people, and take care yourself (consuming sake makes slippery roads slipperier, and unfamiliar street even more unfamiliar! ).